In the summer of 2009, the regime of Ayatollah Ali Khamene'i was rocked by demonstrations throughout the major cities of Iran as people from all walks of life protested the fraudulent results that had reelected the ayatollah's ally, Mahmoud Ahmadinejad, as president. In scenes that transfixed viewers from across the world, the "Green Movement" publicly and loudly protested the voting scam and then the clerical regime itself. But no sooner had the protesters begun to mobilize popular support for ending the 30-year mullahcracy when the regime's shock troops, the Nirou-ye Moqavemat-e Basij, (Mobilization Resistance Force) and its cadet branch, the Student Basij Organization (SBO) sprang into action, suppressing the uprising. This Iranian student attends a rally for Basij week. A senior Revolutionary Guards official recently announced that the Basij will soon be expanded to elementary schools. The Student Basij has asked for a "second cultural revolution" to purge universities of dissident and opposition elements. This policy was promoted during Ahmadinejad's first term and resulted in the expulsion of university students and professors. While much has been written about the Basij, its relationship to the Islamic Revolutionary Guards Corps (IRGC), and the two groups' roles in governing Iran and in squelching resistance, less is known about the younger, student branch. In fact, the student branch's importance is growing, both as a tool used by the regime to help in the suppression of dissident students and professors and perhaps more importantly as an ideological "school," grooming future mid- and upper-level managers of the regime's apparatus. With more and more of the Iranian government in the hands of former IRGC and Basij members, the student movement that helps entrench the ruling clerical establishment in power warrants further study. Today, one of the most important organizations is student and Islamic scholars Basij. Seminary and university students are required to do their best to defend Islam and the Islamic Revolution in scientific centers. My Basij children must guard the unchangeable principle of independence from the East and the West in these two centers ... The Revolution's children are required to prevent U.S. and [former] Soviet mercenaries from penetrating those sensitive places. I agree with the SBO and believe that it is necessary, but it must be noted that only university students shall be allowed to get involved in it. The armed forces shall by no means be allowed to enter universities with the purpose of establishing the SBO and/or running it. Thus the regular armed services, whose officers may not have been sufficiently ideologically "pure" for the task were kept away from what was to become a student paramilitary organization. Instead the General Staff of the Armed Forces established a center for university Basij with a directive on November 25, 1989, assigning the IRGC responsibility for its execution. The SBO was intended both to recruit students for the Basij and to strengthen the Basij ideological-political capabilities. In 1990, the Supreme Council of Cultural Revolution reconfirmed the central IRGC's responsibility for the SBO. Tehran University's Basij was established as the first bureau of the organization on January 3, 1990, and it soon assumed responsibility for establishing Basij offices at other universities. War veterans and Basij forces who were already studying at universities welcomed the establishment and inauguration of the bureaus and most of them enrolled in the bureaus. However, some groups opposed the establishment of these SBO cells. Dissident groups such as the Office for Consolidating Unity (Daftar-e Tahkim-e Vahdat) and national-religious groups argued that the SBO was not an independent student organization but rather a governmental institution with a somewhat murky legal status. They recognized that the group owed its existence to "the fact that the political system's ideological institutions were concerned that students might distance themselves from the regime's ideals." The 1990s witnessed a rapid development of the SBO at universities nationwide. Agreements were concluded between the Basij and various governmental ministries during that period, which helped strengthen and develop SBO activities at universities and higher education centers. While the SBO grew at the universities under Hashemi Rafsanjani's administration (1989-97), there was little overt political activity on its part. Although Daftar-e Tahkim-e Vahdat dominated the university's student associations at this time, the Rafsanjani administration nurtured the SBO, perhaps in anticipation for when it would be pressed into duty. With changes in the ruling elite, the SBO would soon take on a new, more assertive role. Mohammad Khatami's victory in the 1997 presidential elections and the active role played by university students, particularly members of the Student Islamic Councils and Daftar-e Tahkim-e Vahdat, in supporting the so-called reformist movement pushed the SBO to enter the political arena and to oppose Khatami and his supporters. On January 31, 1998, Supreme Leader Khamene'i addressed Tehran University's Basij students urging them to take a more active role in politics. "I do not see any limitations for this organization except the limitations drawn by your own fundamentals, ideological and political positions." Khamene'i recommended that the SBO take guidance from such scholars as hard-liner Ayatollah Mesbah-e Yazdi. The SBO was now urged to get involved in political activities more than previously in order to counteract reformist students. In addition, Mesbah-e Yazdi's hard-line ideological and anti-Western currents began to dominate the SBO and become far more expansive in the coming years. Thus in 1997, Mesbah-e Yazdi's institute became responsible for instituting and developing the Velayat (guardianship) plan for students, providing them with additional ideological and political training. My name panics both professors and students. If necessary, I will riot in the university. If necessary, you must leave your classes and follow me. If I order that you set fire to everything, you must set fire. If I ask you to break everything, you must break. … resorting to the sword will be our last strategy. We will need weapons, and we have them. There are some brains whose calcium carbonate is too much. We must shoot at them so that the extra calcium carbonate will be ejected. The SBO's counter-activities against university students culminated in the organization's cooperation with other paramilitary groups in suppressing the July 1999 student movement. When students protested against closure of the reformist newspaper Salam, the SBO, in collaboration with other groups such as Ansar-e Hezbollah, attacked the Tehran University dormitories, killing one student and sparking six days of riots during which at least three other people were killed and more than 200 injured. As a reward for the SBO's loyalty and to support its continued growth, the government passed a bill later that year providing for a special quota for entrance to universities, setting aside 40 percent of the entry space available to tuition-free state universities and to Islamic Azad University, a semiprivate institution with several campuses in different cities, for active Basij students. Although this legislation was not enacted for state universities under Khatami, its passage helped at least 200,000 Basij easily gain admittance to Islamic Azad University. Ferment among university students increased during 2001-05 as students became frustrated with the "reformist" government of Khatami and began criticizing the entire governing system. Even some regime-dependent reformists began to switch their support to other student groups. Khamene'i and the more radical wing of the ruling elite began to pay more attention to the SBO in light of its 1999 performance at the Tehran University dormitory and the growing alienation of university students. As a result of its strong organizational structure and the political and material backing of the authorities, the SBO began to dominate the universities. Relying heavily on subsidies enacted in 1999, the SBO managed to increase its numbers from some 200,000 in 2000 to around 420,000 in 2004. During this period, Ayatollah Khamene'i urged the Basij to pay more attention to the cause of "justice" in Iran. The catch phrases "justice" and "social justice" became two key terms promoted and manipulated by the conservative wing in its battles against the reformists. In the name of "social justice," the SBO began to organize outspoken and destabilizing activities, demonstrating in front of the judiciary and other state buildings, holding seminars keynoting the reformists' opponents, and leading campaigns against poverty in coordination with other far right student groups that blamed the Khatami administration for its continued blight on society. The SBO also developed public relations campaigns that projected a positive image of these groups and their values. Protests against Khatami's administration intensified with marches, sits-in, speeches, and new student publications criticizing the president and his supporters for their stances on political development and civil society. Large numbers of university students under the guidance of the SBO boycotted elections for the second city council of Tehran, the parliament, and the 2005 presidential elections. 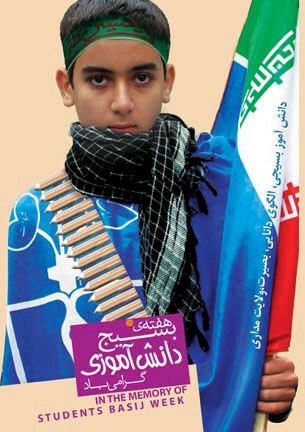 The Student Basij thus played a critical role both in criticizing and opposing the Khatami reformist administration and in suppressing opposition and dissident university students. Their efforts were rewarded in 2005 with the election of the hard-line Mahmoud Ahmadinejad as president. It is the task of the Basij student to support the government. The ninth government is a Basij government, and just like Basij, to date it has taken brave steps to improve the conditions of the country and tangible services. The SBO has since taken on whatever role the Revolutionary Guards deem necessary. Referring to the student-fronted takeover of the U.S. embassy, IRGC commander Muhammad Ali Ja'fari declared, "We want to create a situation where, if necessary, the SBO takes actions similar to what happened on November 4, 1979." In this environment, the SBO has asked for a "second cultural revolution" at universities to combat such groups as the Leftist Student Movement and Pro-Democracy Liberal Students Movement. Arguing that universities have turned into a breeding ground for thought that deviates from Islamic ideals, the SBO seeks to purge universities of dissident and oppositional elements. This policy was enthusiastically promoted during Ahmadinejad's first term, resulting in the expulsion of numerous students and the retirement of many university professors. The SBO enjoys the capability to change its functionalist nature and enter a new phase of defending the Islamic Revolution should the revolution be threatened by a superior danger ... Because of this, the Basij student takes pride in being a member of this paramilitary. In February 2008, the IRGC unveiled its new "Plan for Change and Development," which devotes additional resources to improving the quality of the SBO. The main purpose is to enhance the ideological education of SBO members and to prepare them for positions in the government. Full-scale support by the Ahmadinejad administration for Basij students has enticed more students into the organization. From 420,000 members in 2004, the rolls jumped to over 600,000 in 2007 with estimates of approximately 90,000 active members. Hojjat al-Islam Ta'eb, previously commander of the Basij, has declared a goal of 901,000 SBO members in the next four years, about one third of all university students. The number of SBO offices has also increased in this period from 1,700 to 2,600 bureaus in 700 higher education centers. The Student Basij are organized and run in a top-down fashion with the main headquarters in Tehran at the helm. Each of Iran's thirty provinces is also designated an SBO region and controls multiple zones. Each zone in turn directs ten to fifteen SBO bases located in almost every faculty in every university. Although there are no precise demographic studies of the Student Basij, some statistics indicate that the number of female students is greater than males. For example, on November 4, 2003, in a SBO gathering of 50,000 students, 57 percent were women. This could be due to the growth of the female student population as well as the benefits membership brings in terms of higher education and future employment. Since SBO has branches in every city and province, its members came from different ethnic groups including Azeris, Baluchs, and Arabs. Even religious minority students such as Christians, Zoroastrians, and Jews can join the SBO, which is why the regime has decided to establish a new special organization to mobilize the religious minorities. Some 62 percent of Iranians believe that material considerations are the key motivating factor for joining Basij. Although it is widely believed that Basijis have been paid cash during crises and unrest, there is no conclusive evidence available. Many students join the SBO as a result of their desire to enter the postgraduate level and find employment. Since 2000, when the regime passed the law allocating a 40 percent quota in universities for active Basijis, membership in the SBO increased dramatically. Moreover, some students join the SBO in pursuit of rapid advancement within the power structure. Students looking for quick social and political mobility but lacking the appropriate social status or connections often join the Basij. Basij membership offers a range of privileges for students, especially to those from lower socioeconomic backgrounds. Although they do not get money directly, they receive discounts on textbooks, entertainment, food, use of swimming pools, and travel inside Iran as well as travel to holy shrines outside of the country in Mecca, Syria, and Iraq. This is a very important privilege in Iranian society, especially for female students from poor or conservative families. Finally, some students join the Basij because of their Islamic beliefs and their commitment to the regime as an Islamic state. Some of these recruits come from religious and war veteran families with a conservative background. They join to defend Islam and the revolution. The exact percentage of Basij students who fall into this category is not documented, but it is believed to be low. Still, ultimately membership in the SBO derives from a combination of ideological and materialistic-opportunistic motivations. According to its articles of association, recruiting new members is the primary mission of the SBO. On entering the university, all students are able to join the SBO; they need only fill out a form and take a photo and a copy of their ID card to the SBO office. The office immediately issues a membership card as a regular Basij member. The organization holds recreational camps and pilgrimage trips in which new students get better acquainted with the SBO's objectives and are recruited further. During academic semesters in order to identify and recruit new members, the SBO also holds short-term recreational, cultural, and religious camps, including the free Rahian Noor Camp, which sponsors visits to former war fronts. Students must be active members to take advantage of such privileges as the quota for postgraduate study. They must spend six months after the initial stage and undergo additional training with required courses that include ideological and political indoctrination and military training with instruction in information protection, weapons familiarity and use, modern war theory, psychological warfare, riot and anti-riot methods, Islamic ideology, jurisprudence, and religious duties. After they have passed these courses and following a six-month probationary period of continuous activity, students become active members of Basij, subject to the approval of the relevant Basij ideological-political selection committees. The SBO also seeks to instruct university students on how to work with other governmental institutions and organizations. After they become active members, SBO students have to pass additional specialized courses in ideological, religious, political, and military topics if they want to upgrade their ranks. Students also attend courses designed to help members recognize enemy threats in domestic and international arenas, intended to indoctrinate students in the ideology of the mullahcracy. Top Basij students are selected for additional intensive ideological and political courses. Originating in 1997 after the electoral success of the reformists, the initiative was suggested by hard-line leader Ayatollah Mesbah-e Yazdi and implemented under the supervision of the Imam Khomeini Education and Research Institute. One month each summer, professors authorized by Mesbah-e Yazdi and his special disciples instruct this elite group. According to statistics from the Imam Khomeini Education and Research Institution, more than 26,616 students have gone through this course of studies. The head of the SBO is also a member of the discipline committee, which is responsible for penalizing students who commit administrative, political, and moral violations. The committee employs students to act as committee liaisons and agents, collecting information about their peers. Basij students also work hand in glove with "Commanding the Good and Forbidding the Evil" committees (komite-ye amr be ma'ruf va nahy az monkar). These are a type of morality police who take their inspiration from Islamic law. The objectives of these committees include "propagating the culture of prayers and benediction … propagating the personal characteristics of infallible imams …[and] enhancing the knowledge of Islamic catechisms." SBO members also serve as informants for HARAST, a branch of the Ministry of Intelligence. An SBO report on suspect activity will often result in a summons for further investigation. When a protest takes place on campus, the SBO cooperates closely with university law enforcement departments to suppress dissent as they did in July 1999 and after the disputed 2009 presidential election. The SBO emerged at universities in the early years of the second decade of the Islamic Revolution as a counterweight to other student Islamic associations, which were leaning toward the left wing of the regime. Once the fundamentalists won the elections in 2005, the SBO stopped opposing the government and has become a key instrument for enforcing the clerics' hold on the universities. Particularly following the 2009 disputed election, the regime increased support for the Basij in general and the SBO in particular. They have become a useful tool for Supreme Leader Khamene'i and his regime as soldiers in a cultural and political war within Iran's universities. The important role played by SBO in controlling and suppressing dissent by students makes them one of the most important groups in Iranian society. As the student movement in Iran has been one of the most prominent actors in the struggle for democracy, freedom, and justice, the SBO plays a critical role in keeping opposition in check. SBO students perform a key role in identifying opposition students and providing firsthand reports of dissident activity to security forces. Upon graduating, they take leading roles within other governmental and quasi-governmental organizations, helping to perpetuate the system. They are thus a fundamental prop holding up the Ahmadinejad administration and the theocratic regime he fronts. Saeid Golkar is a postdoctoral scholar at the Center on Democracy, Development, and the Rule of Law, Freeman Spogli Institute for International Studies, Stanford University. See, for example, Ali Alfoneh, "The Basij Resistance Force: A Weak Link in the Iranian Regime?" PolicyWatch no. 1627, The Washington Institute for Near East Policy, Washington, D.C., Feb. 5, 2010; BBC News, "Profile: Basij Militia Force," June 18, 2009. See, for example, Frederic Wehrey, Jerrold D. Green, Brian Nichiporuk, Alireza Nader, Lydia Hansell, Rasool Nafisi, and S. R. Bohandy, The Rise of the Pasdaran: Assessing the Domestic Roles of Iran's Islamic Revolutionary Guards Corps (Santa Monica: RAND, 2009) . Sayyed Mustafa Torabi and Nabiullah Ruhi, Basij dar Partov-e Qanun (Tehran: Ayeh Cultural Publications, 2001), p. 102. Cited in Nowruz Hashemzehi, Tahlili bar harakatha-ye daneshju'i dar Iran (Tehran: Culture and Science Research Center, 2001), p. 104. Torabi and Ruhi, Basij dar Partov-e Qanun, p. 144. Majid Mohammadi, Dar-amadi bar raftarshenasi-ye siyasi-ye danishjuyan dar iran-e emruz (Tehran: Kavir Publications, 1999), p. 137. Ashna'i ba Basij-e Daneshju'i (Tehran: The Cultural Deputy of the Student Basij Organization, 2007), p. 59. Alireza Zakani, "Lozum-e tahavvol-e hame janbeh," Asr-e Omid Azar, Center for SBO Research and Studies, Tehran, 2006. Torabi and Ruhi, Basij dar Partov-e Qanun, p. 105. Gholam Hussein Darabi, "Tarh-e Basij va Ahdafha-ye an," Iran-e Farda (Tehran), 49 (1997): 113; Ali Akbar Mahdi, "The Student Movement in the Islamic Republic of Iran," The Journal of Iranian Research and Analysis, Nov. 1999, pp. 5-32. Mustafa Mir Salim, Jaryanshenasi-ye Farhangi dar Iran pas az Enghelab (Tehran: Baz Publications, 2005), p. 555. Nader Entessar, "Student Unrest and Iran's Military," Journal of Iranian Research and Analysis, Nov. 1999, pp. 120-3. BBC News, July 11, 2000. Mehdi Khani, Dar-amadi bar Shakhsiyat-e Basij (Tehran: Culture and Knowledge Institute, 2001), p. 142. Shargh (Tehran), Feb. 26, 2006. Aftab-e Yazd (Tehran), Jan. 25, 2007. Saeid Golkar, "Black Crow to Barbie, Changing Student Norms in Iran," ISIM Review, International Institute for the Study of Islam in the Modern World, Leiden, Netherlands, Fall 2005. Alireza Zakani, notes on a meeting of SBO members with the supreme leader, Feb. 12, 2001, accessed June 21, 2010. Ashna'i ba Basij-e Daneshju'i, p. 61. Cited in Wehrey, et al, The Rise of the Pasdaran, p. 42. Fars News Agency (Tehran), Jan. 4, 2009. Aftab-e Yazd, May 29, 2006. Sarmayeh (Tehran), May 10, 2009. "Basij-e daneshju'i va karkardha-ye motefavetash," Kalam-e Daneshju-ye Basij (Tehran), Nov. 2005. Kayhan International (Tehran), July 24, 2008. Jomhuri-ye Eslami (Tehran), July 12, 2005. Iranian Student News Agency (ISNA, Tehran), Nov. 24, 2008. Sobh-e Sadeq (Tehran), Nov. 4, 2003; author observations as a student and lecturer at Iranian universities. Da'ud Parchami, "Bar-rasi-ye Gerayesh-e omomi be Basij," Basij Studies Quarterly (Tehran), no. 18-19, 2003, p. 79. Barnameh va sharh-e vazayef-e jazab va sazmandehi (Tehran: Student Basij Organization, Tehran University, 2001), pamphlet no. 1. Hasan Ghasemiyan, Akhlaq va adab-e mo'asherat-e Basij (Tehran: Basij Resistance Force, IRGC, 2000), p. 8. Darbare-ye Tarh-e Velayat, website of Velayat plan, accessed Aug. 12, 2008. Islamic Republic News Agency (IRNA, Tehran), July 13, 2005. Mahmoud Abdullahi, "An Analysis of the Effects of the Commanding the 'Good and Forbidding the Evil' and 'Student Discipline' Committees' Performance in Improving the Atmosphere of Universities," unpublished research paper, library of the Iranian Supreme Council of Cultural Revolution, 2006, p. 4. Fox News, June 19, 2009. Related Topics: Iran | Summer 2010 MEQ receive the latest by email: subscribe to the free mef mailing list This text may be reposted or forwarded so long as it is presented as an integral whole with complete and accurate information provided about its author, date, place of publication, and original URL.